Hamlet was the son of Esther Ashcroft and John H.R. Bayley and was born in Birmingham, England in 1836. According to the record of death, above, his middle name was Alfred. Most of the time he just went with his middle initial, A, but in a census taken when he was 14, he is listed as Ambros and that is the name I think is probably correct. He is also listed as married both in the record of death and in the obituary but his wife is not named in either. 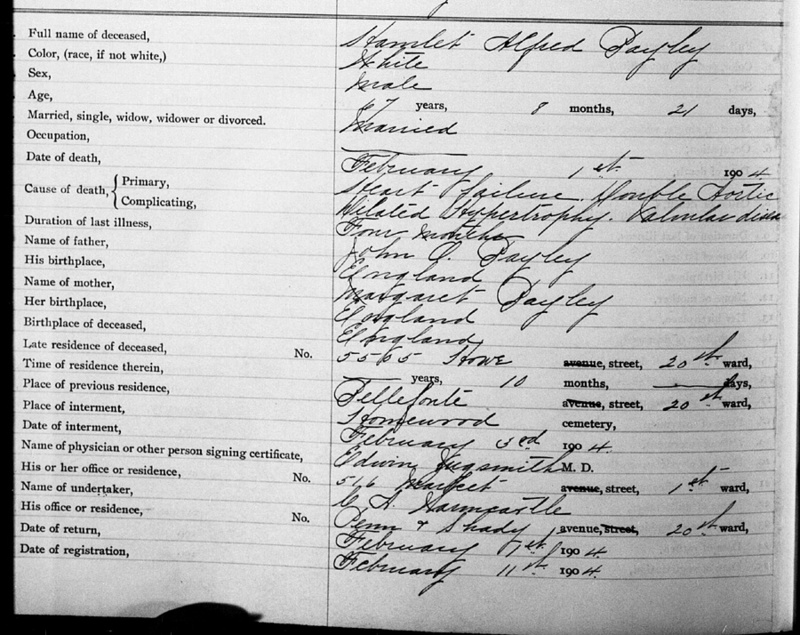 In the 1900 census he is a widower and a boarder in someone else's house. This wife is a mystery. In the death record his residence at death was 5565 Howe St. but he had only been living there for ten months before his death. Before that he was living on Bellefonte Street, no address given. In 1900 he was boarding at 214 N. Negley Ave., so in the last years of his life he moved often. He came to Pittsburgh from England about 1894 because his three children had all moved to the United States and lived in Pittsburgh. His daughter, Annie and her husband, Charles Edward Miller, and family were living in Pittsburgh. The Miller children were his only grandchildren as neither of his sons had children. He died from heart failure on 1 February 1904 when he was 68. He was buried two days later in Homewood Cemetery in Pittsburgh. The record of death for Hamlet A. Bayley is from the Registry of Deaths in the City of Pittsburgh, PA, Bureau of Health, Dept. of Public Safety. Image of record and indexed data is from FamilySearch.org, extracted from FHL MF 505877: Registration of Deaths in the City of Pittsburgh, vol. 118-120, 1903-1904. Record is in vol. 119, p.478.